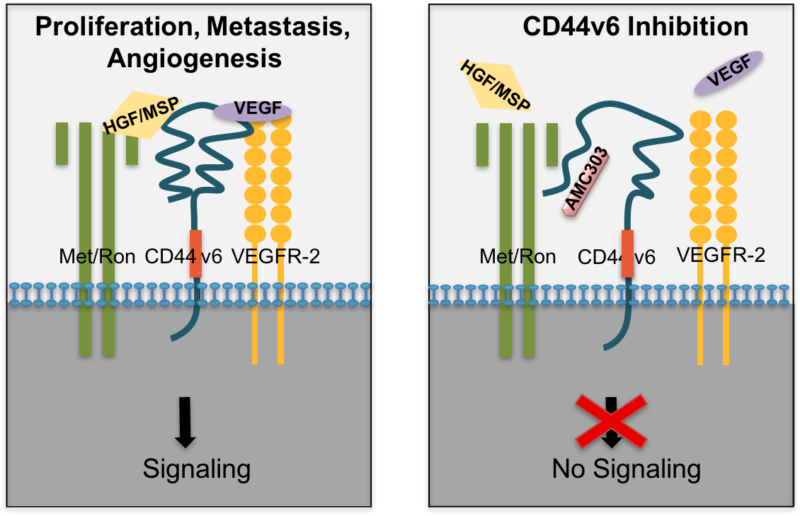 Our novel approach uses peptide-based compounds that target one highly specific co-receptor, CD44v6, which blocks several relevant oncological pathways (VEGF/VEGFR-2, HGF/c-Met and MSP/RON) involved in tumor growth, angiogenesis and the development and regression of metastases. Compared to currently available treatment options that address only one receptor tyrosine kinase e.g. VEGFR or one growth factor e.g. VEGF, our series of compounds are first-in-class inhibitors with a significantly improved specificity and different mode of action. The compounds are based on a short sequence of natural amino acids and therefore offer a good potential tolerance and a moderate or absent immune response. amcure’s unique approach and its potential efficacy could bring real advantages over current treatment options. In addition, the use of our compounds has demonstrated the ability to induce regression of already developed metastases in different types of cancer. AMC303, our lead compound, is being developed as a potential treatment for patients with advanced and metastatic epithelial tumors, e.g. pancreatic cancer, head and neck cancer, gastric cancer, colorectal cancer, breast cancer and lung cancer. AMC303 has demonstrated strong effects in various in vitro and in vivo assays.